This study was completed on a single 4’ diameter manhole measuring a depth of 4’ at 20816 Dawn Dr. Lago Vista, TX. This manhole was precast with no resurfacing material. 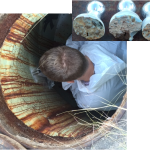 The manhole was located behind an office building with very little flow. The manhole was coated in 1999 with Raven 405 with an average of 125 mils. There were no visual defects or active leaks in the coating. During the original application of the Raven 405, the manhole rig was coated. Since then the ring has rusted to the point where the coating is no longer adhering to the ring. Raven recommended that the coating be terminated below the rig and a flexible chimney seal, such as Raven 581 is used to seal between the ring and chimney. 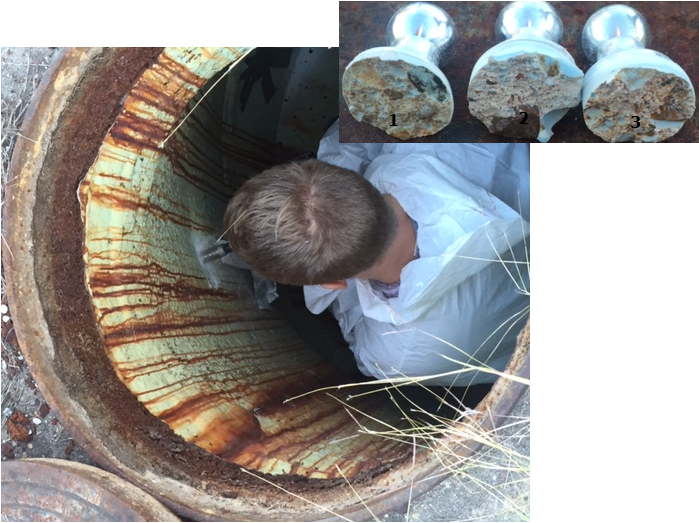 Structure Results: This manhole was on the east side of the parking lot and had three 20mm dollies glued to the coating and cored.